Introduction. 2. Earthquakes, Why and Where do They Occur? 3. Structure of the Earth's Interior. Crust. Mantle. Core. 4. Seismic Waves. Basic types and essential properties. Propagation paths. 5. Travel Times. 6. Seismographs and Seismological Observatories. General considerations. Recording systems. Instrumental frequency characteristics. Analog and digital records. 7. Seismograms and Interpretations. Local and regional events. Volcanic earthquakes. Unusual seismic sources. Teleseismic events 10<&Dgr;<103°. Teleseismic events &Dgr;>103°. References. Subject Index. Geographical Index. Frequent updating of existing interpretation codes and routines is a prerequisite for modern seismogram interpretation and research. 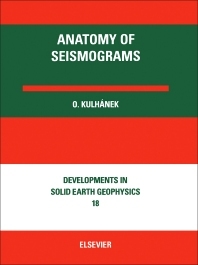 The primary goal of this book is to present in a rather tutorial form all the necessary information and techniques pertinent to essential seismogram interpretation. The treatment is descriptive rather then mathematical, and emphasis is placed on practical aspects, especially for the benefit of students and junior seismogram interpreters affiliated to seismographic stations and observatories. Those workers more knowledgeable in seismology, and curious enough in the detailed deciphering of seismogram peculiarities, will also find the presentation useful. The book is divided into two parts: a verbal description (Chapters 1-6) and a collection of 55 plates (Chapter 7) with interpretations. The verbal description explains in a rather elementary form the most fundamental physical phenomena relevant to seismogram appearance. The collection of plates exhibits a large variety of seismogram examples, and the corresponding interpretations cover different seismic sources (tectonic and volcanic earthquakes, underground explosions, cavity collapse, sonic booms), wave types, epicentral distances, focal depths and recording instruments (analog, digital, short- and long-period, broad band). The book compliments older manuals in that both analog and digital records are considered. Seismograms from more traditional narrow-band as well as from modern, broad-band instruments are displayed. Tectonic and volcanic earthquakes are represented, and the exhibited seismograms form a worldwide collection of records acquired from seismographic stations located in North and Central America, Asia, Europe and New Zealand, i.e. in various geological and tectonic environments. Terminology and usage of definition does vary among agencies in different parts of the world; that used in this book is common to Europe.